Falling Waters has three separate locations in Naples. The "main" location that most people think of is on Davis Boulevard. This location offers a 10,000 sq. ft. tropical resort style pool, with lake and waterfall views as a backdrop from the lanais. There is also a beach resort near where US41 intersects with 951. This complex has a lazy river pool and waterfalls throughout the community. 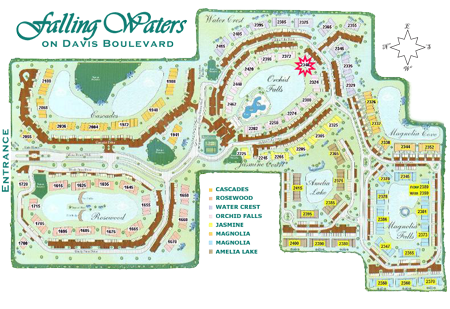 Lastly, there is a 19-acre community called North Preserve that features a free flowing pool and waterfalls.